On Sale Now! Save 8% on the IRWINQUICK-GRIPOne-Handed Mini Bar Clamp 6 Pack, (2) 4-1/4'', (2) 6'', (2) 12'', 1964749 by Irwin Tools at Tizimi Press. MPN: 1964749. Hurry! Limited time offer. Offer valid only while supplies last. The IRWIN QUICK-GRIP One-Handed Mini Bar Clamp 6 Pack, Light-Duty, is the perfect clamp set for smaller projects and working in confined spaces. 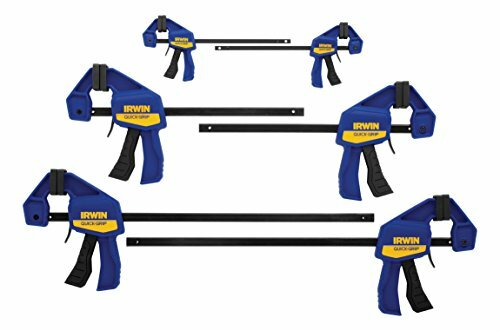 The IRWIN QUICK-GRIP One-Handed Mini Bar Clamp 6 Pack, Light-Duty, is the perfect clamp set for smaller projects and working in confined spaces. Reinforced resin bodies and hardened steel bars ensure strength and durability. These clamps feature non-marring pads to protect work surfaces, one-handed quick-release triggers and provide up to 140 lbs. of clamping force. Set includes two 4-1/2", two 6", and two 12" One-Handed Mini Bar Clamps.